lower left: P.Champagne.F Ao. 1649.Aetas.54. Jean François Joly de Fleury [d. 1702], the son-in-law of the sitter; the Joly de Fleury family; by inheritance to the de Buttet family, Bourget du Lac, Savoie; sold 1950 to (Rosenberg and Stiebel, Inc., New York); sold 1950 to the Samuel H. Kress Foundation, New York; gift 1952 to NGA. Madeleine Talon, youngest daughter of the sitter, married Joly in 1664; she died in 1684. See Guglielmo Gola, letter to Perry Cott, 6 January 1958, in NGA curatorial files. Provenance provided to the Kress Foundation by Rosenberg and Stiebel; see Kress collection records, in NGA curatorial files. France in the Golden Age: Seventeenth-Century French Paintings in American Collections, Galeries nationales du Grand Palais, Paris; The Metropolitan Mus. of Art, New York; Art Institute of Chicago, 1982, no. 16, repro., as Portrait of Omer II Talon. 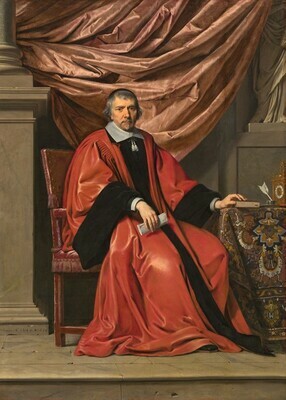 Philippe de Champaigne 1602-1674: Entre politique et dévotion, Palais des Beaux-Arts de Lille; Musée Rath, Geneva, 2007-2008, no. 39, repro. Paintings and Sculpture from the Kress Collection Acquired by the Samuel H. Kress Foundation 1945-1951. Introduction by John Walker, text by William E. Suida. National Gallery of Art, Washington, 1951: 210, no. 93, repro. Frankfurter, Alfred M. "Interpreting Masterpieces: Twenty-four Paintings from the Kress Collection." Art News Annual 16 (1952): 127-128, repro. Cooke, Hereward Lester. French Paintings of the 16th-18th Centuries in the National Gallery of Art. Washington, D.C., 1959 (Booklet Number Four in Ten Schools of Painting in the National Gallery of Art, Washington, D.C.): 14, color repro. Paintings and Sculpture from the Samuel H. Kress Collection. National Gallery of Art, Washington, 1959: 346, repro. Walker, John, Guy Emerson, and Charles Seymour. Art Treasures for America: An Anthology of Paintings & Sculpture in the Samuel H. Kress Collection. London, 1961: 150, repro. pl. 141, color repro. pl. 142. Cairns, Huntington, and John Walker, eds., Treasures from the National Gallery of Art, New York, 1962: 102, color repro. Walker, John. National Gallery of Art, Washington, D.C. New York, 1963 (reprinted 1964 in French, German, and Spanish): 316, repro. Thuillier, Jacques, and Albert Châtelet. French Painting from Le Nain to Fragonard. Geneva, 1964: 33-34, repro. Summary Catalogue of European Paintings and Sculpture. National Gallery of Art, Washington, 1965: 26. Cairns, Huntington, and John Walker, eds. A Pageant of Painting from the National Gallery of Art. 2 vols. New York, 1966: 2:296, color repro. Rosenberg, Pierre. Philippe de Champaigne. Milan, 1966: 5-6, no. 8, fig. 8. European Paintings and Sculpture, Illustrations. National Gallery of Art, Washington, 1968: 19, repro. Dorival, Bernard. "Recherchés sur les portraits gravés aix XVIIe et XVIIIe siècles d'aprés Philippe de Champaigne." Gazette des Beaux-Arts, 6th ser., 75 (May-June 1970): 265, 272-273, 317, repro. Walker, John. National Gallery of Art, Washington. New York, 1975: 319, no. 424, repro. Dorival, Bernard. Philippe de Champaigne 1602-1674: La vie, l'oeuvre, et le catalogue raisonné de l'oeuvre. 2 vols. Paris, 1976: 1:7, 101, 128, 132, 134, 189, 2:124, no. 218, repro. 441. Eisler, Colin. Paintings from the Samuel H. Kress Collection: European Schools Excluding Italian. Oxford, 1977: 287-289, fig. 258. Watson, Ross. The National Gallery of Art, Washington. New York, 1979: 77, pl. 63. Walker, John. National Gallery of Art, Washington. Rev. ed. New York, 1984: 317, no. 420, color repro. Freedberg, David. "Van Dyck and Virginio Cesarini: A Contribution to the Study of Van Dyck's Roman Sojourns." Studies in the History of Art 46 (1994): 156. Pericolo, Lorenzo. Philippe de Champaigne. Tournai, 2002: 203-204. Hand, John Oliver. National Gallery of Art: Master Paintings from the Collection. Washington and New York, 2004: 172-173, no. 133, color repro. Conisbee, Philip, et al. French Paintings of the Fifteenth through the Eighteenth Century. The Collections of the National Gallery of Art Systematic Catalogue. Washington, D.C., 2009: no. 10, 54-57, color repro.